Awesome Ribeye. Happy to have Great Lakes on tap. Nice staff. Talked with the cheffs afterwards and they're great guys too. Saw the cover picture of the bar here om google before going and didnt know what to expect. Was very pleasantly surprised. In a word, "wonderful" dining experience. The food source, preparation and service are all exceptional. We're so lucky to have this in historic Perrysburg! We have dined at Rose & Thistle several times in the past couple years, and each time the meal is totally fabulous. The steaks are cooked to perfection, with wonderful flavor, and we have tried several other dishes, and appetizers, and loved them all. It is a very small, elegant space. The service is always excellent. For the quality of the experience, I also find the prices to be quite reasonable. If there is one weakness, it is the limited menu. However, I would rather they have limited options, and keep the quality high, then go expand and have to sacrifice this. I would recommend Rose & Thistle very highly. 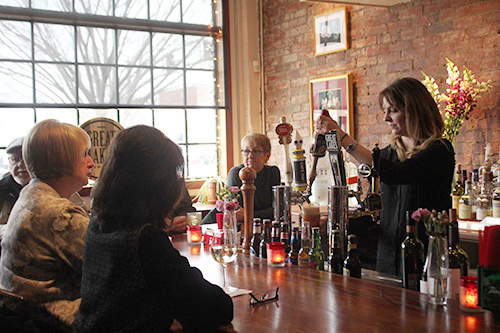 The Rose and Thistle is a great place to meet friends for a drink or enjoy a delicious dinner. The food is prepared by Chef Matt the owner. The atmosphere is warm and friendly.